The On-line trading system of the Exchange is accessible to its Members through multiple modes of secured connectivity such as Multi-Protocol Label Packet Switching (MPLS) and Internet. Network latency may vary depending upon the mode of connectivity and the geographical distance between Member’s trading location and the Exchange. The Members of the Exchange may choose the mode of connectivity best suited to their business needs. MPLS is an industry standard technology which provides very fast switching speed and is used in “Quality of Service” and secure VPN (Virtual Private Network) vastly. This is an economical solution that delivers a wide variety of advanced, value added services over a single infrastructure. In any robust Exchange Trading System, one has to take utmost care of Confidentiality, Integrity and Reliability of the data/information due to which all members should opt for the services of MPLS for bidding and other mandatory tasks in a secure and reliable manner. 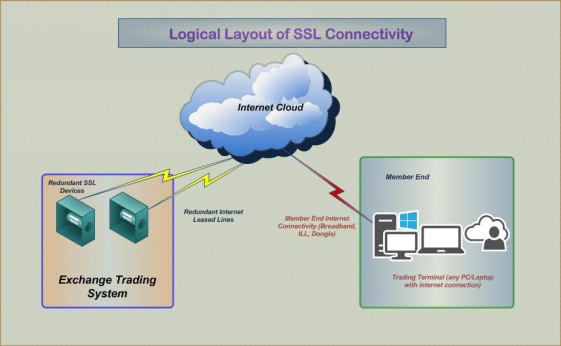 Apart from SSL technique (through Internet), Exchange servers can be accessed by the members (pan India) through MPLS circuits. 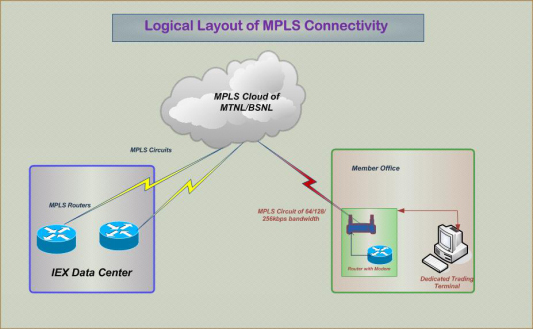 MPLS Services from renowned Service Providers should be taken, links would get terminated at Data Centre from service provider Cloud, and corresponding MPLS circuit (from ISPs) have to get terminated in member premises also for establishing secure connectivity between member terminal (dedicated) and Exchange servers (Data Centre). Secure Socket Layer is a computer networking protocol for securing connections between network application clients and servers over an insecure network, such as the internet. SSL creates a foundation of trust by establishing a secure connection ensuring the remote users that their connection is secure and environment is trusted to carry out confidential transactions. In Exchange Trading System, separate SSL devices are implemented with utmost care of Confidentiality, Integrity and Reliability, user credentials are given to trading members of the Exchange for accessing the Exchange Trading System though SSL. Members are only required to have stable internet connections at their end through which remote & secure connectivity could be established for accessing Exchange Trading System and carry out their confidential transactions.